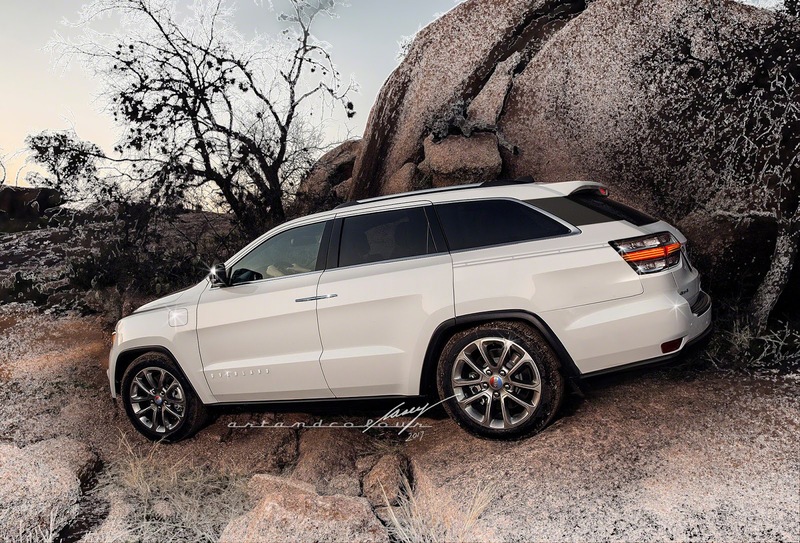 Casey/artandcolour's all new, aluminum-bodied, all wheel drive, plug-in electric family crossover, the Jeep Overlander/E for 2018. Enough descriptors in that first sentence, lol? Jeep would work hard to make sure this conveyance would be Trail-Rated. Cribbing from a modern classic, the current Jaguar XJ saloons, I've added a Piano Black trim panel on the D-pillar tying in the side- and backlites. I think I've done it a bit more artfully though, making it look less like it's trying to be wraparound glass and more like it's an artistic way to use trim to lessen the visual bulk of the top third of the car. 2018 AMC Gremlin X. Wait, what? Needless to say, American Motors Corporation is no more, but that didn't stop me from imagining what a bang-up-to-date Gremlin may have looked like. I've given my rendering all the modern conveniences and equipment, although I favor a rear wheel and rear wheel-biased, all wheel drive layout for better design proportions and handling. Not every SUV/Crossover needs to have four doors. Not every buyer needs the maximum space afforded by near-vertical rear compartments, either. My latest Photoshop creation was created for people who prefer the longer doors of a two door vehicle, aiding greatly in entrance to the front seat. The sloping roofline covers fitted luggage designed to maximize the rear compartment. 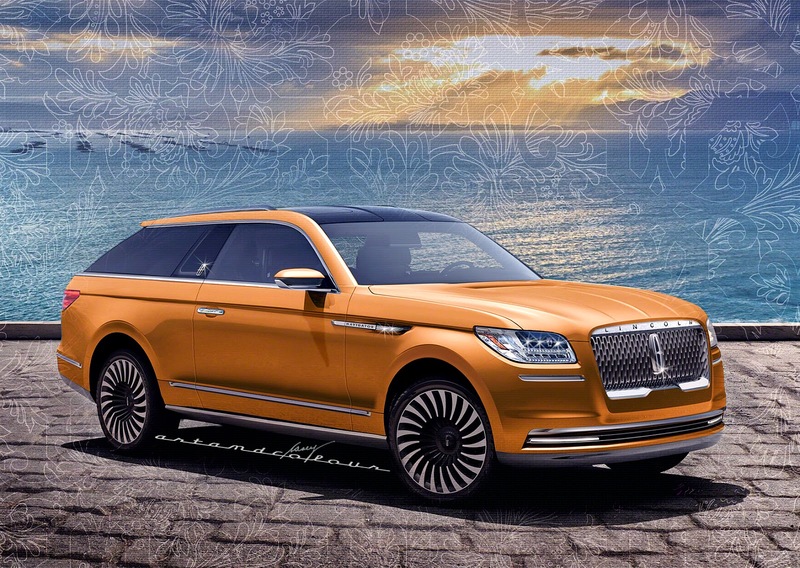 This is my take on such an über luxury vehicle for 2018, the Lincoln Navigator Mark X Coupe. Did I mention it has a twin-turbo V12/Hybrid drivetrain? The famed "Mark" series migrates to the exclusive all-aluminum Navigator platform for the first time in history, affording outstanding room and capability to the luxury class. Starting with the new-for-2018 Navigator 4-door, I lengthened the body ahead of the cowl by about 8-inches to accommodate the longer V12 powertrain. Longer doors maximize entry into the front compartment and a programmable entry system features remote access to the First Class-level individual rear seats. The exclusive V12 drivetrain features twin turbochargers and hybrid-assist and is combined with an also-exclusive electronically controlled 12-speed transmission. 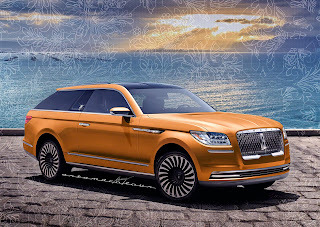 I think Lincoln is coming along nicely with their new Continental-inspired front ends but I still think it needs more developing. For this Mark rendering, I added a brushed chrome header to the existing grille space and added the LINCOLN name to it. I think it completes the front end. 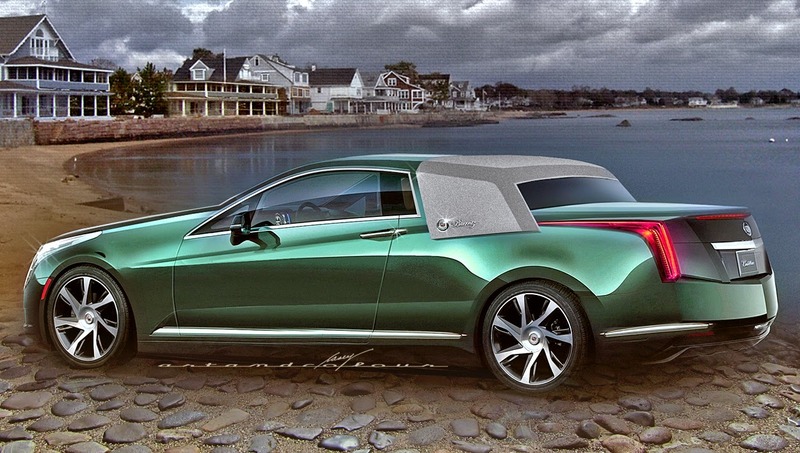 2018 Lincoln Continental Mark Town Car concept, ©2017 casey/artandcolour. 2017 Caprice-The Return of the RWD B-Body! I started out wanting to recreate the luxury of the original Chevrolet Caprices, the mid 1960s models. Once I started pushing the pixels around on a brand new Impala I was surprised to see how easily I could turn it into a modern-day late 1980s/90s Caprice. I'd love to see a domestic model with a rear wheel drive-based powertrain, although these days there would have to be an all wheel drive hybrid model. With my recently proposed "Heritage" division proving to be quite a popular idea online, I've extended a similar concept to the "new" Chrysler corporation, now owned by Fiat of course. I'd call this new division "American" to recall AMC as well as point out the fact these are fully American vehicles and would always be built wholly within the United States. With all of the AMC as well as Plymouth and DeSoto nameplates available, my first introduction would be this Javelin SST plug-in electric sports coupe. 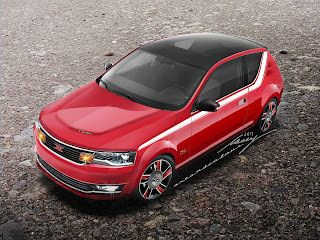 Leave the monster Hemis and Hellcat engines to Dodge, "American" would be their electric car division. What look like retro tape stripes are actually aero "tunnels" stamped into the sheetmetal to help keep airflow attached without large spoilers and airdams. Full LED lighting front and rear as well as quite a bit of carbon fiber used in the body structure help keep weight to a minimum. What appears to be the Javelin's vinyl roof is actually polished carbon fiber sail panels designed to assist airflow to the rear lip spoiler, also in the interest of economy and quietness. Electronic all wheel drive would also be featured. I'm proposing GM add a specialized division called "Heritage" to its stable of nameplates. With the demise of Pontiac and Oldsmobile, and in decades past, LaSalle for example, there are so many great nameplates in the dust bin. Many were huge sellers for the corporation and many still live in the hearts of potential buyers. My first rollout for this new division is the Camaro-based Trans Am. Heritage cars would of course be based on regular production models, just as these nameplates were in the past. Start up costs would just be for the restamped sheetmetal and interiors. Each GM dealership would be given the opportunity to pair with Heritage for almost no cost. These cars would almost sell themselves with the free publicity the press would give such a bold move on GM's part. Other nameplates for the future could include Cutlass, Grand Prix, Bonneville, Catalina, even Firenza, and 88/98. I chose summertime in Nantucket for the first Heritage roll out for this Trans Am because who wouldn't want to attend, lol? The great reviews would almost write themselves. This is a full-sized Lincoln Continental Coupé, with lineage back to the svelte 1966 and '67 models. 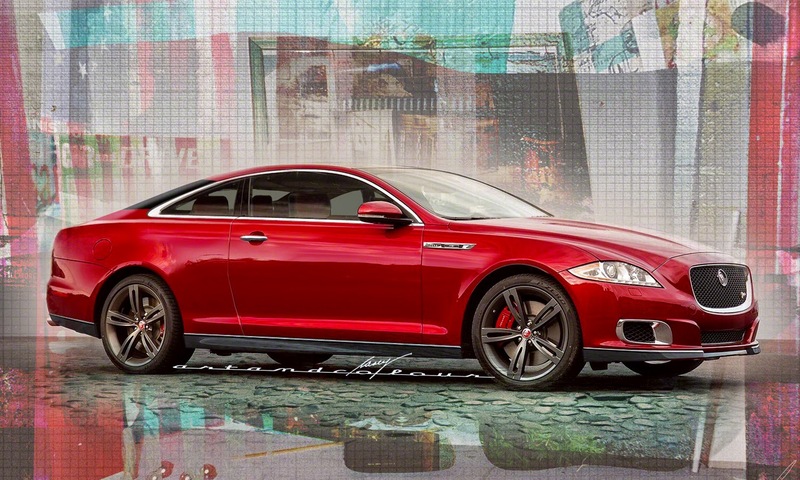 It's not a Mark series; that will be somewhat tighter with more dramatic lines and more private rear seating. 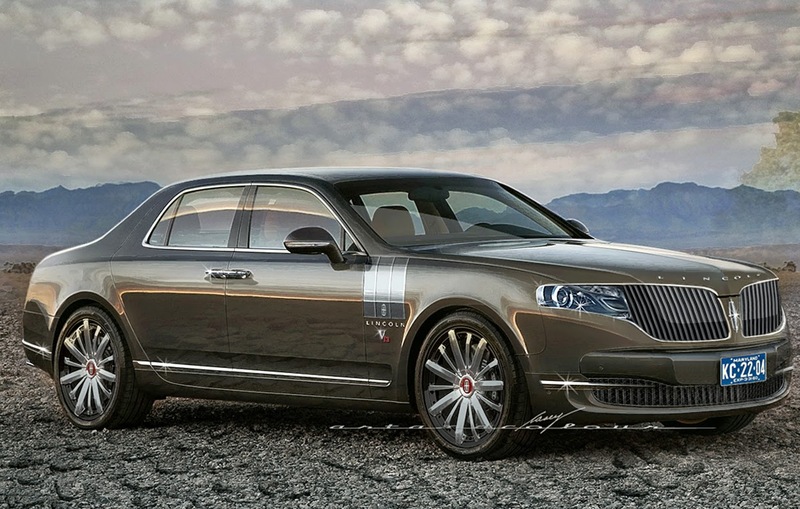 I lengthened the recent Continental concept by about 8-10 inches in front of the cowl, to give it a proper stance. I also shortened the front overhang about 4 inches changing the front end significantly in just proportion. I also lengthened the rear overhang but left the rear wheels where they were. The roofline has been altered with a more direct touch-down to the trunklid. This is definitely a 3-box design. The wheels have modified centers from the '72 Mark IV complete with octagonal caps. The red cloisonne center caps indicate the EcoBoost V12, one of three powertrains including a full plug-in electric with quad-turbo range-extending V4. 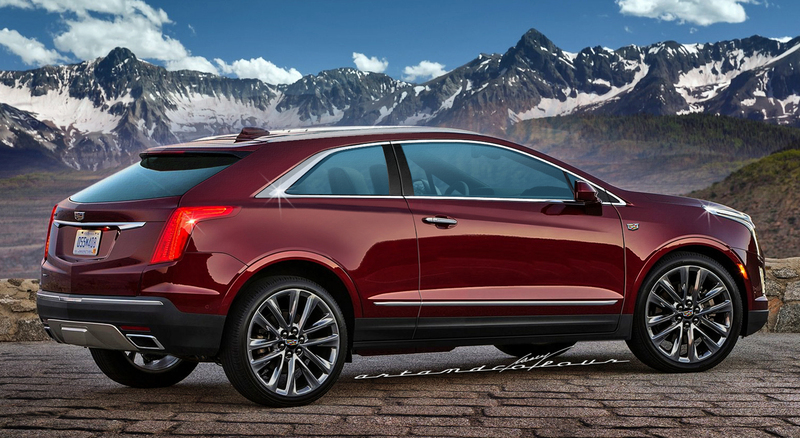 High technology, a world-class drivetrain, superior styling and production quality will all define the new Lincoln. 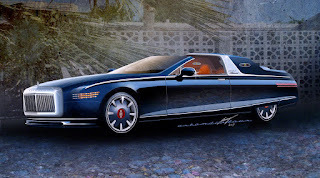 My revived Eldorado coupe, aimed at Lincoln's new Continental sedan, carries a bespoke powertrain. 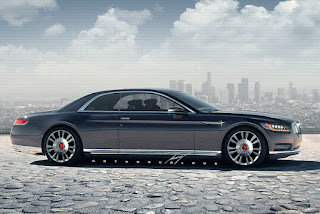 Its twin-turbo V12 engine is also hybrid assisted and features electronic all-wheel drive. 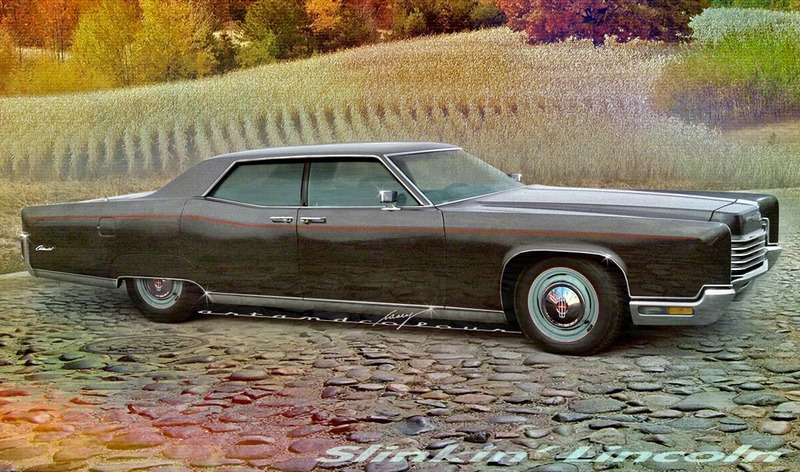 Bluff and blocky, as all safety-laden cars are these days, this Eldo is nonetheless elegant and aerodynamic. Carving a bit of time recently and resurrecting applications... 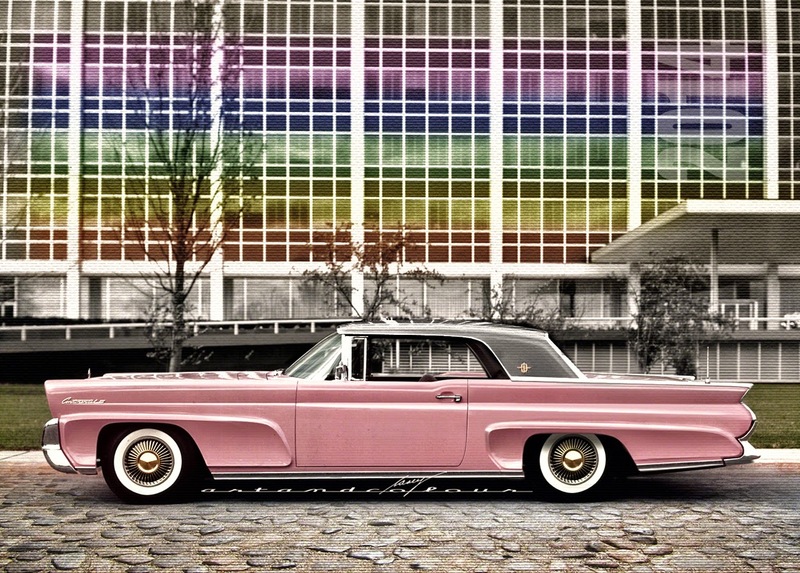 This is the 1958 Thunderbird Sedan Delivery I wish I could deliver my art in. Porthole windows from the '57 2-seater would have been used in the pillars in the rear for some carryover panache. 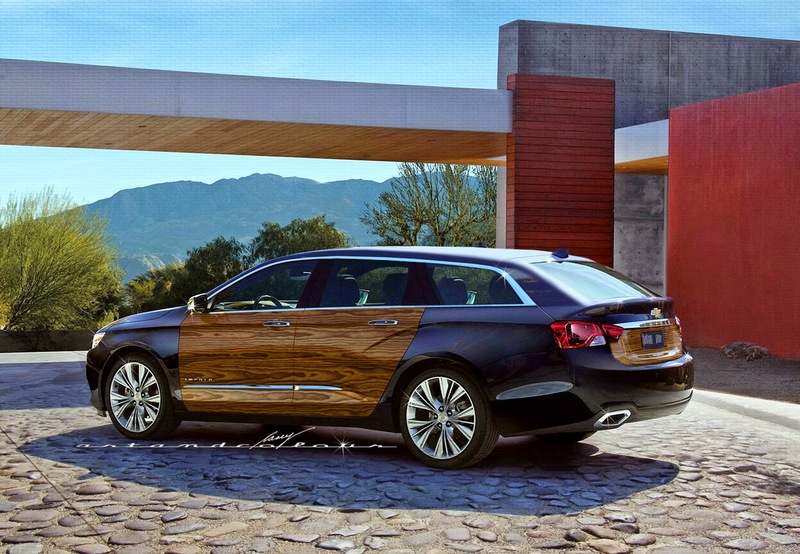 Chevy could use a new Kingswood Estate in its Impala lineup. 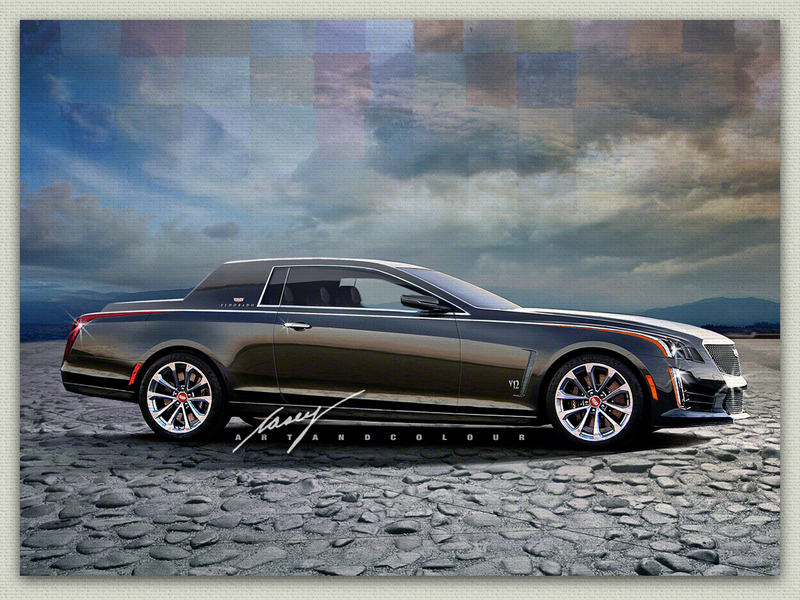 2015 Cadillac Flagship. XTS-L? Fleetwood? Perhaps my recent Buick Limited's corporate cousin could be this Cadillac RWD sedan. I'm calling it "the flagship" but only because I really can't decide if it's a Fleetwood or an XTS-L. Cadillac is working on such a car right now under the name of LTS but that sounds more like a Chevrolet to me. Anyway, this chop is a relatively basic one. 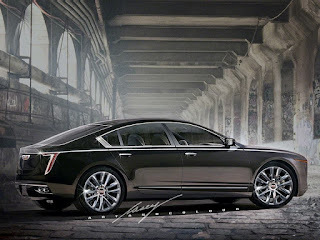 Basically, I pushed and pulled the pixels of the original XTS concept, the Platinum, to make it a long hood/short deck "proper" Cadillac sedan. I also swapped in the new wreathe-less Caddy logo. My jury is still out on the look of the new logo, but it's growing on me. 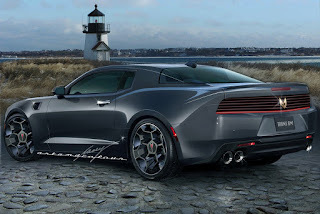 I've seen spyshots of the new "LTS" and it won't be using the rear quarter windows I've included in the door. It seems it will have an extended version of the 6-windowXTS styling. I just hope it doesn't look too "fastback-y." I hope they field a proper 3-box sedan. Note. I no longer have a computer with Photoshop on it so I'm not going to be able to do any more work like this in the foreseeable future. I will update this blog for awhile with some of my older chops, but I apologize in advance for the lack of any new pieces. Thank you to everyone who checks in here regularly. It's been quite fun to make these for you and to read your comments. 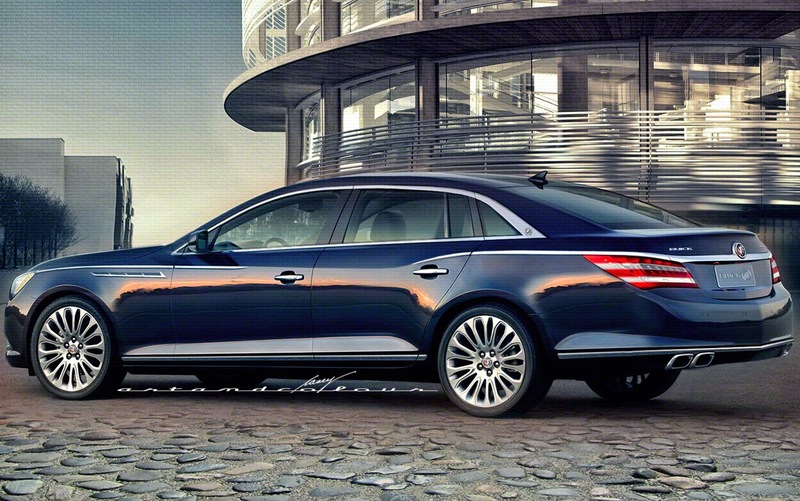 Buick's new flagship could be this Limited, a RWD-based AWD sedan with a long 125" wheelbase comparable to the German LWB sedans. Taking a page from the Lexus salesbook from 1990, this is an S-Class sized car for the price of an E-Class. 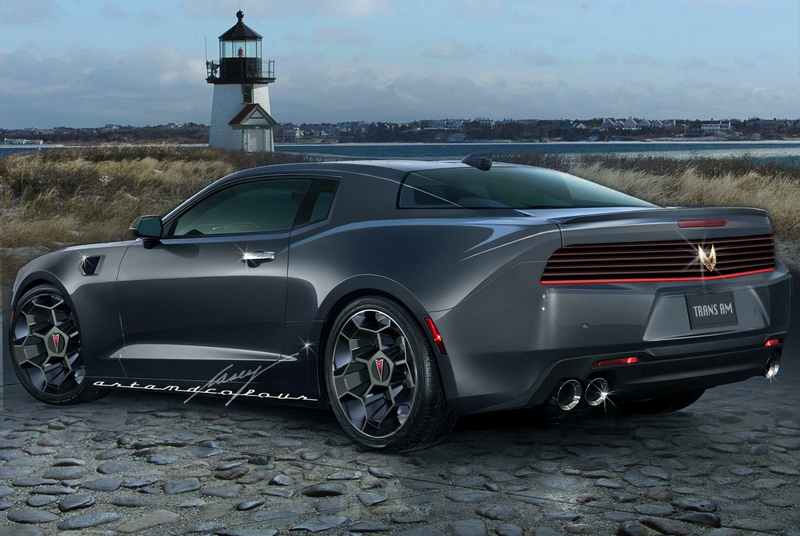 I'd envision it with a Twin-Turbo V6 in both gas- and diesel-powered versions. 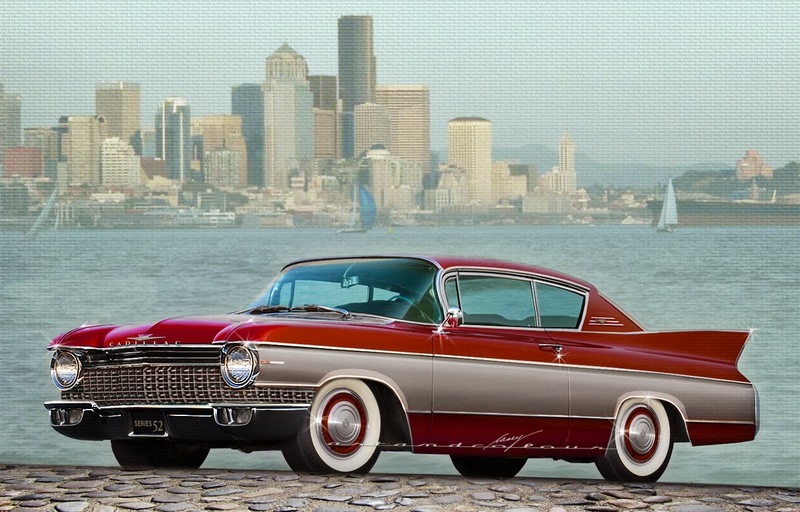 Yes, One More '58 Continental! I've become completely fascinated by the huge unit-bodied Lincolns and Continentals of 1958-60. I guess my regular readers can tell, lol. This time I've moved beyond the side profile and attempted a front 3/4 shot. My main "theme" for this angle was to do something with the huge canted headlight pods and the bodysides which appear to flare out at the bottom instead of tucking in. I eliminated the headlight pods altogether with hidden headlights and I was shocked at how well that look integrated into the '58 body! The grille now simply wraps around slightly, seeming to tuck behind those "pontoon" front fenders in a way many from the Classic period did. The bodysides have been "filled out" and the rocker panels redesigned to tuck under and around the bottom of the car, All of the sheetmetal has been subtly reworked to be fuller with less "indents" everywhere. I started with a '58 but soon realized with the extended front fender scallops and the reworked roofline it may have been easier to start with the 1960 model, lol. I finished off with a very '50s two-tone paint job meant to evoke the Classic period as well, with a design that seems to disappear behind the front fenders, too. This is a serious stab at creating a true follow-up to the gorgeous Mark II of '56 and '57. I've done an earlier version but that one was tongue-in-cheek, here. This version was created with an eye toward full production... Biggest change beyond the new proportions are the restyled rear fenders. I modified the front fender "scallop" motif for these new, shorter rear fenders, tying the side together in a more cohesive way than the way they were. I also kept the rear wheelwells open instead of skirted, to more closely align this III with the II and to keep the car as light appearing as possible. 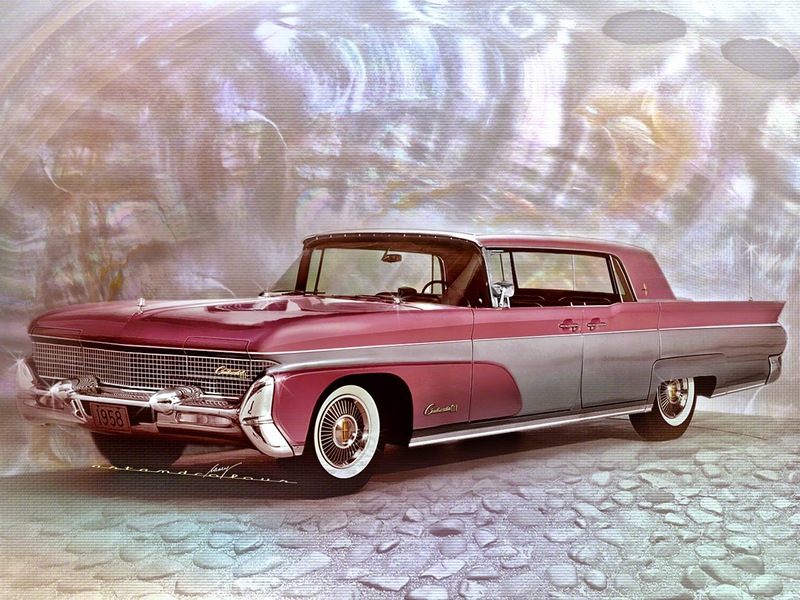 The "T-Bird" style roof with flat, inset rear window would include a powered center section, sliding down behind the rear seat and a small, stainless steel visor powers out from the roof when the backlight is lowered. That long hood points to the first production postwar V12 in the American luxury class. 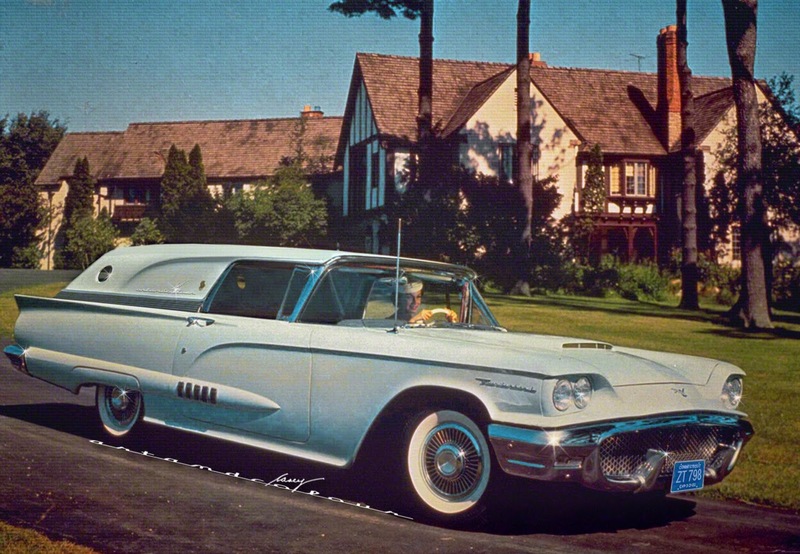 The lowered body and roofline, as in the '58 Thunderbird, would mean a raised driveline "hump" necessitating a full length console front-to-rear and four bucket seats. Leathers and fabrics would rival the crosstown competition, the '58 Cadillac Eldorado Brougham. The roof of this example is clad in dark-tinted brushed stainless steel panels which perfectly complements the dusty rose metallic body color. Pink-and-Gray were my college's school colors and I'll consider this an homage to my recently missed 35th Reunion! 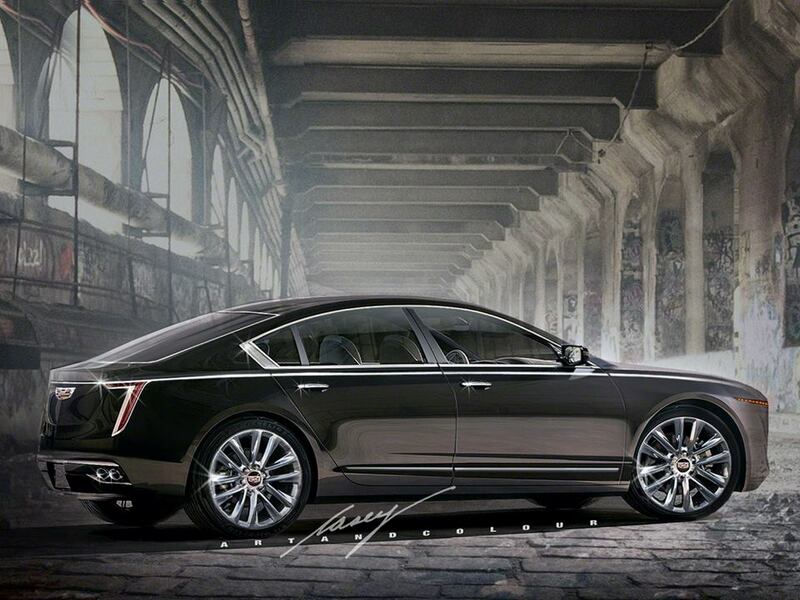 Looking at my recent 4-door Jacqueline rendering, here, I wondered what it would look like with the classic V-and-Crest logo used by Cadillac for decades. The Jacqueline's trunklid was bare except for a chromed lock. I used a late 1950s version for the "V" and I liked what it looked like. Then the taillights looked way too plain for anything Bill Mitchell would have approved, so I extended the side chrome spear all the way around the taillights. I tied them together with a very Sixties brushed aluminum trim piece. The painted C-pillars became adorned with pebble-grained leather inserts. 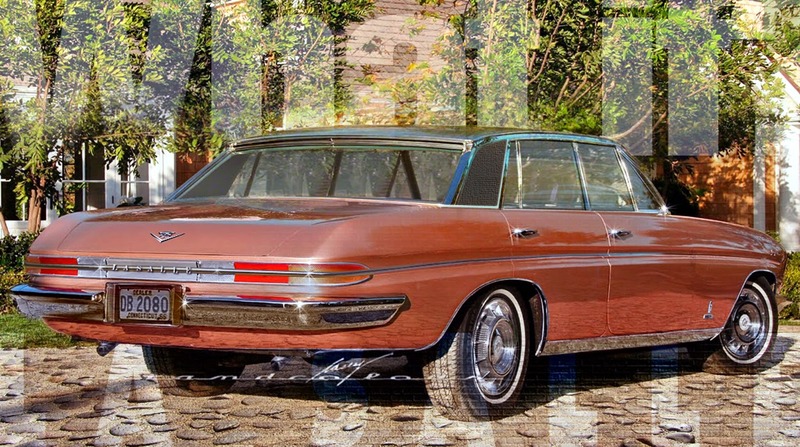 I also changed to color to a very elegant peach-tinted silver metalflake, and the interior would have been a combination of that black pebble-grained leather and pleated peach leather or brocade. I rarely go back and modify one of my renderings but I'm glad I did. 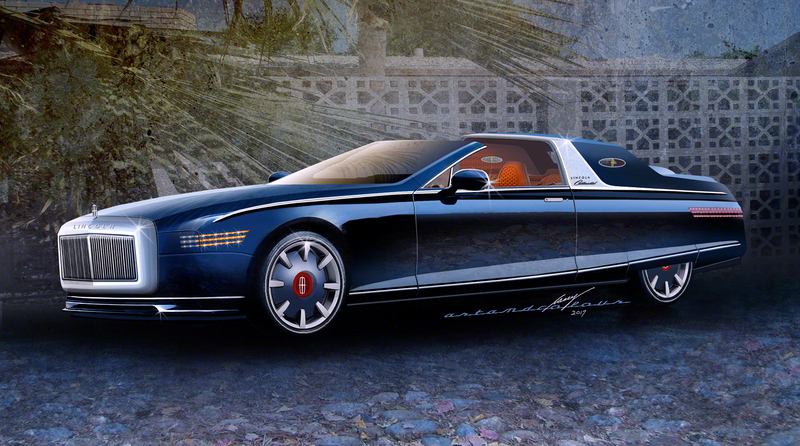 I think Pininfarina was hoping the Jacqueline would be built as the Brougham had been taken away from them. 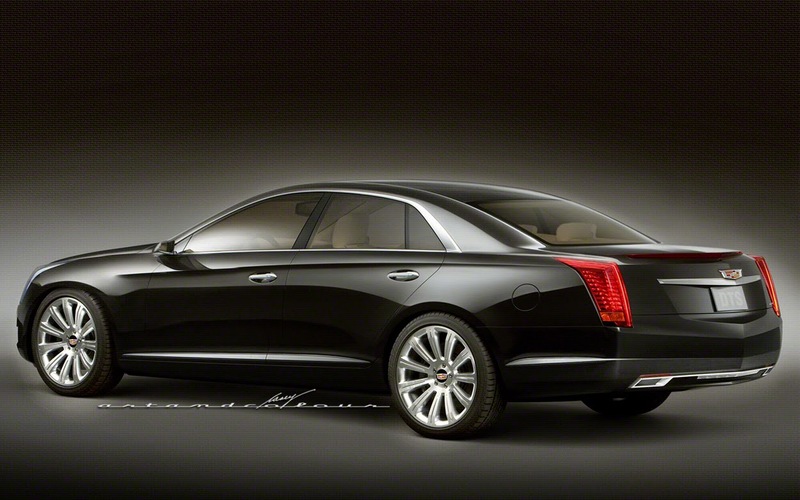 Instead of a coupe if they had done a new sedan maybe they may have scored a new Cadillac to build. If they had used Cadillac logos and nameplates perhaps it would have swayed the powers-that-be enough to be a "Yes." 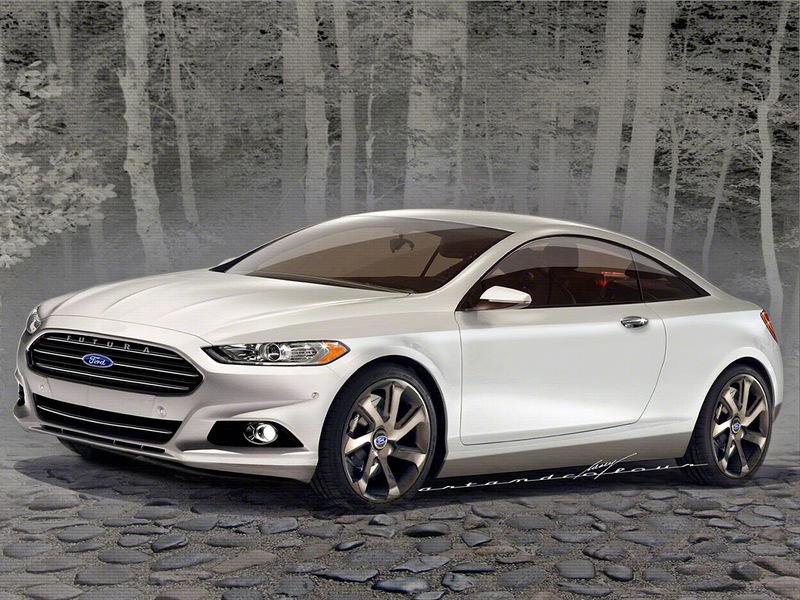 I really believe Ford's lineup is ready for several more coupes. The cleverly designed RWD Mustang shouldn't be the only one. This Futura pillarless hardtop coupe would be the halo car for the next Fusion lineup. I've used a modified Fusion front clip and added it to a very svelte coupe body modified from a Renault concept of a few years ago. Smoothing it all out, I'd like to see Ford's current Kinetic Design begin to morph into the look here. I like their strong front ends but I think many of the angles and creases can become more sophisticated with more tightly controlled surfaces. The right stance is everything and I'd widen all of them. The grille I've designed places the enlarged Ford Blue Oval in the center of a simplified grille insert, with the specific model badging in a nicely sculpted 3D effect nested on the top grille bar. This front end 1-2-punch of model name and marque ID could be spread throughout the line. It also lowers the visual center of gravity from the top of the hood to the grille, which combined with the wider track and more fully filled wheelhouses, really gives this platform and body a ground hugging stance. I was born in 1957 and turn 57 today. Special day spent with a sciatica flare up and intestinal distress. Getting old is hell, lol. It has been a while since I had time to do a brand new chop, but I carved out some time the other night. 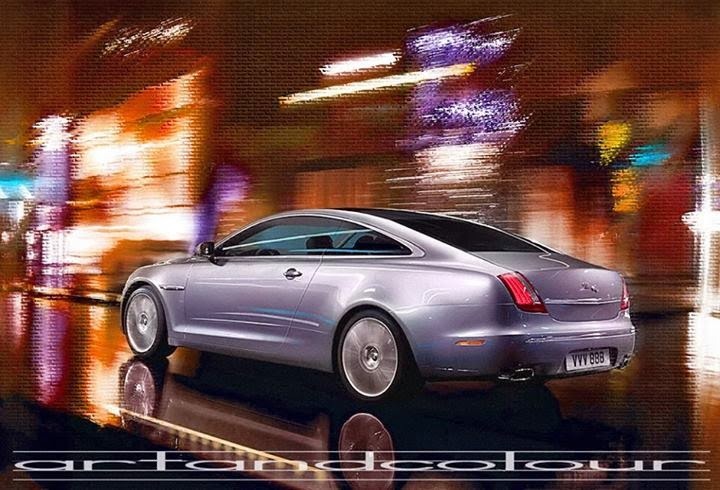 I've done a new XJ coupe in the past, but it was a long-wheelbase model with a pillarless greenhouse. 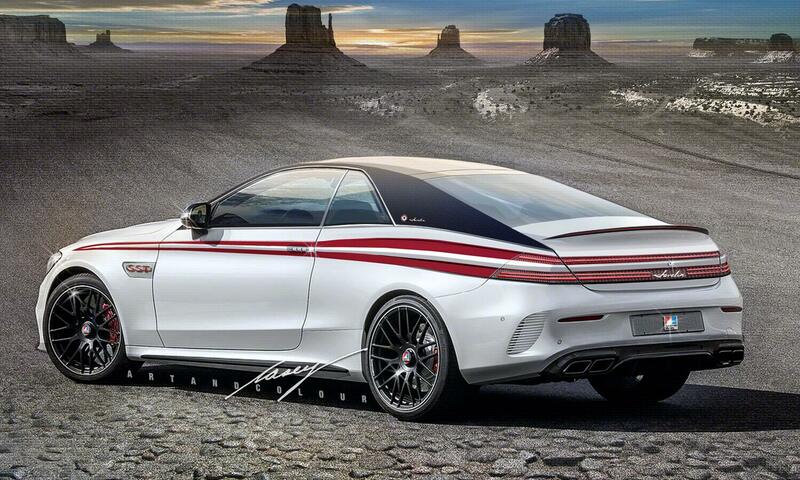 It was a halo car of sorts, meant to take on the big CL Mercedes coupe (now the S Class coupe). This red XJ coupe is a different type of vehicle. I shortened the wheelbase about 6 inches from the sedan, all behind the front seats for a tighter almost 2+2 interior, although this is still a big car so the +2 in the back is still fairly roomy. I kept the rigid B-pillar for the structure and I estimate the weight savings of this aluminum platform over its larger sedan siblings at about 400 lbs. The overall size of my XJ coupe is just about halfway between the XJ and the XF midsize sedan. This time around I kept the sedan's avant garde black B-pillar trim. I've come to appreciate that odd styling touch. My earlier XJ coupe, a long wheelbase pillarless top-of-the-line model. 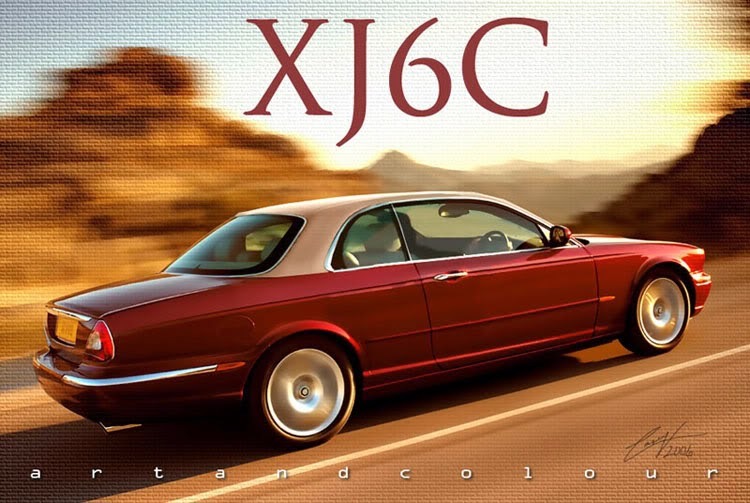 An even earlier attempt to bring back an XJ coupe was this version done before the massively modernized XJ saloon was introduced. I wanted to bring back the elegance of the '70s and '80s big Jag coupe complete with vinyl roof! 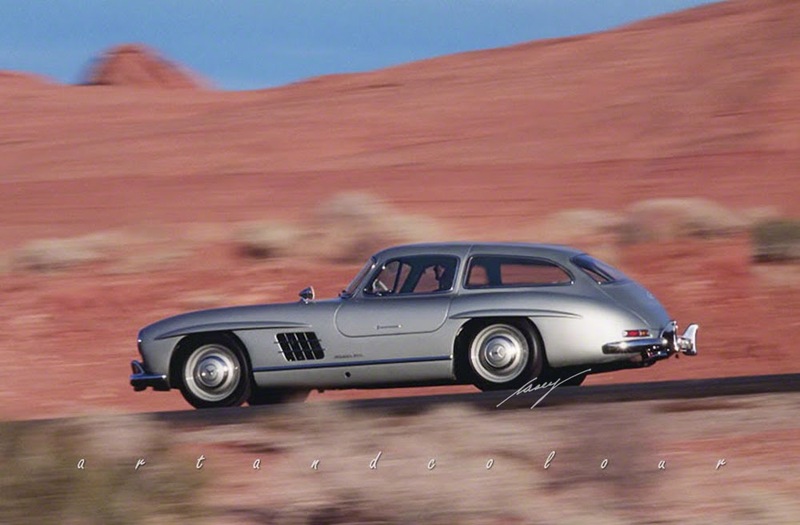 I really think an original 300SL Gullwing Touring model, with fitted luggage and a useful rear hatch, would have made a great fit in the Fifties grand touring market. Aerodynamics may have been even better with the smoothly rounded back ending farther back on the body. Supple Italian leather luggage with aluminum fittings securing it in the rear hold is fitted below the shoulder line for a clean appearance and maximum driver visibility. Having a difficult time carving out time these days to do new work so I thought I'd do another repost. Bear with me please! 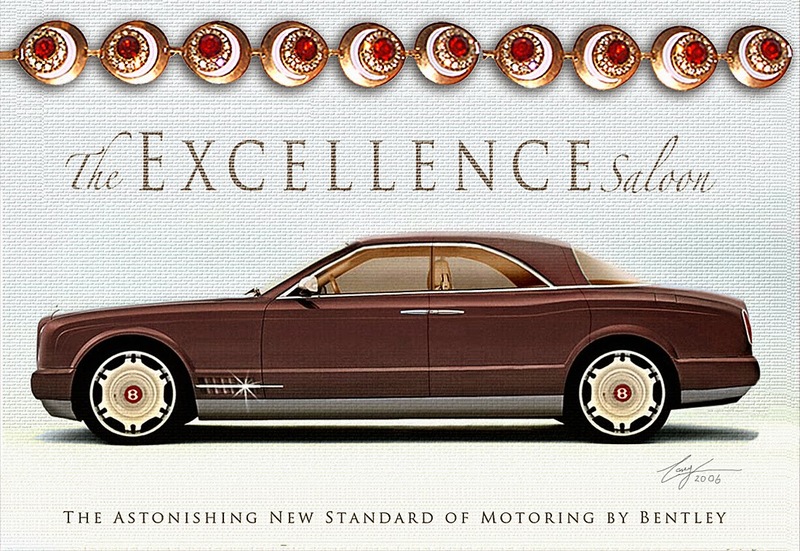 Above, one of my earliest chops, 2006, a Bentley Blue Train coupe. Meant to evoke the fabulous Bentley Boys of the early part of the 20th century, my flagship coupe uses retro cues in a modern way. Although the technicality of these two renderings is flawed, I still like the designs quite a bit. 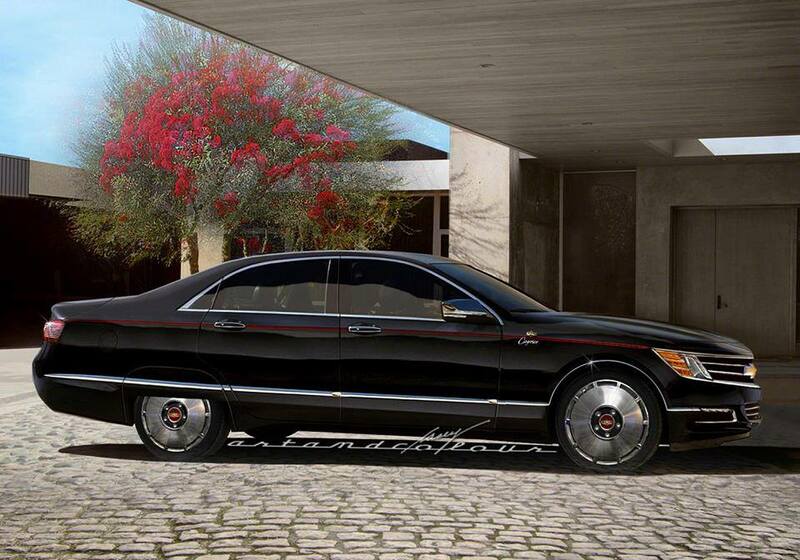 Using a name from Facel-Vega's history, the Excellence is a perfect range-topping sedan. The rear door cutlines extend into the roof creating "ears" like the '67-'71 Thunderbird 4-door for easier entry. I scanned one of my late grandmother's bracelets to use in this "ad" much like Cadillac did in the 1950s, setting the tone for their intended audience. Again, there are many technical flaws with these early works, but I like the design. 1960 Cadillac Series 52: First Senior Compact? My rendering is comical and meant to be, but the idea was an interesting one. 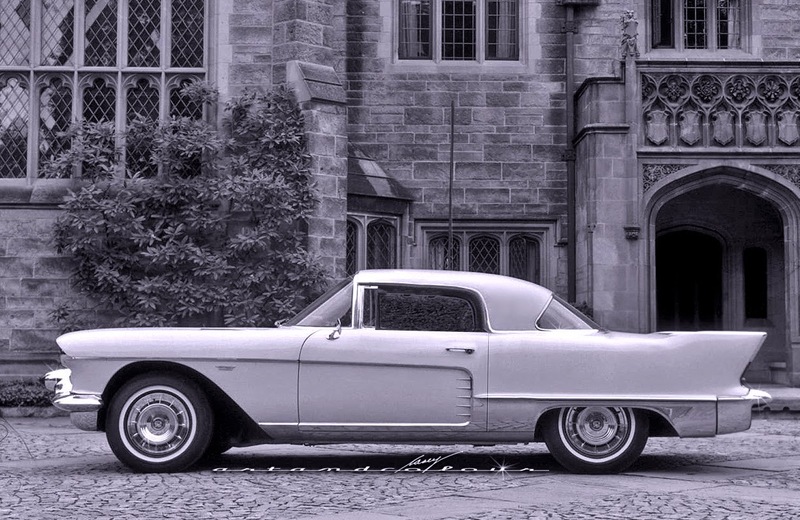 I wondered what Cadillac would have had to do if given the edict to offer a "compact" car in 1960. I thought about what the marque would have to give up to meet the size and cost restraints, and how they'd make the best of them. 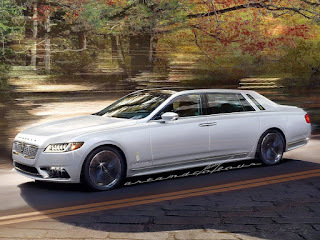 This rendering of a large, über luxurious Lincoln Continental sedan has been viewed more than 5,000 times in the past few weeks. It must have been picked up by a larger website. I thought I'd post it front and center for a few days to make it easier for everyone to find, lol. Actually, this little blog has been picking up lately, with close to 60,000 views just last month. I need to finish a few new cars but it may not be until the weekend. Thanks for checking in! 1970 Lincoln Continental sedan, chopped roof, "fixed" door handles, chrome rocker panel trim added, dog-dish hubcaps with embossed Lincoln "star" created... This very subtle custom would feature the dark gray metallic paint matching the '85 Town Car I drove for years, as would the single red coachst ripe, hand painted of course. The aqua and red trim color scheme derives from Tiffany's Christmas packaging, something the "highbrows" would already know as my Slinkin' Lincoln cruised past them. The interior would feature woven leather strips in aquas, reds, and grays. Blackwalls and painted steel wheels, in this case, custom made 18-inchers, round out my current aesthetic taste! I did a chop many years ago which I named Slinkin' Lincoln. It was also a '70 Lincoln. I can't find an image to link to right now but it was pretty crude, lol. Probably dates to 2006. Just a bit of last-minute fun. Hey, everyone repaints their concepts for various shows, lol! This is my Eldorado Biarritz in its new Emerald Firemist livery. Roof cap is textured and polished stainless as before. I hope everyone had a nice St. Patrick's Day! Rarely do I try to "improve" or "fix" production cars with my chops. I really just try to bring my own taste to the cars I Photoshop. An exception these days is the new C7 Corvette. Every time I Photoshop one I AM trying to fix it, lol. There are some nice things about it and some ghastly things about it. The problems I see range from the small, ie too many black vents, louvers, and crap, to the large, ie, that rising beltline, rear quarter window and awkwardly shaped rear hatch glass. I still don't care for the taillights either, but I've done several renderings with the proper quad circular units, so I've let that go, lol. 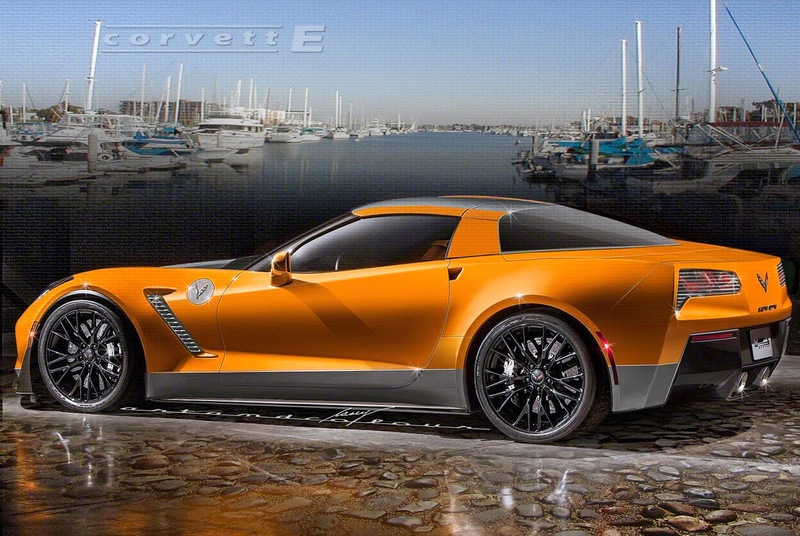 For this latest rendering, I created a plug-in range-extended Corvette coupe, the Corvett-E. 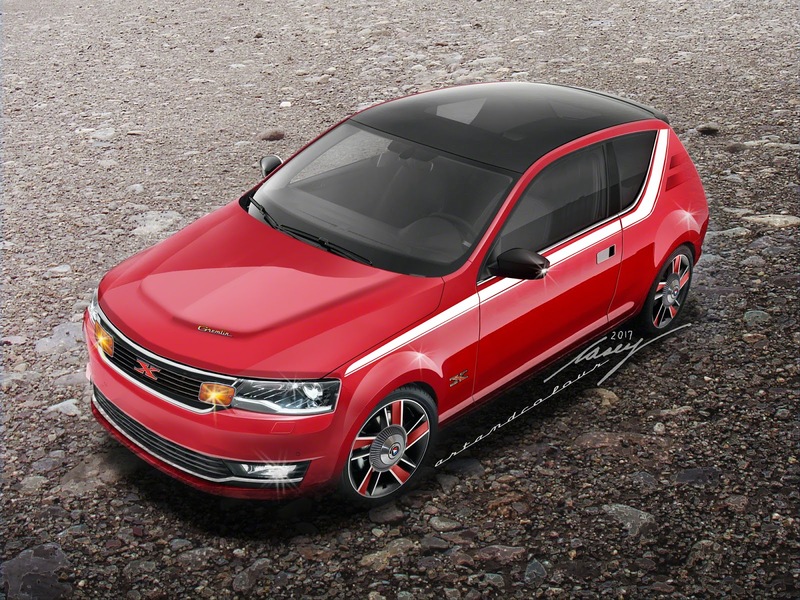 Yes, a very powerful Volt-type powertrain for GM's halo sportscar! To that end I was able to delete all but one set of body vents, and I toned down that front venter gash with body color and chrome. Extruded and polished aluminum rocker panels point to the new alloy "tub" used for the batteries. The body is a mix of carbonfiber and aluminum for light weight. Note the "gas cap" has been moved to the front fender, is now a wonderful polished aluminum, and covers the charging unit outlet. Instead of the quad circular taillights I prefer, I've modified the current ones covering them with bright grilles, "hiding" the lights in a very Bill Mitchell-esque way. These fine chromed louvers exactly match the new front fender vent trim. I've just started a Facebook page for my art, "casey/artandcolour," including my beloved Photoshopped cars. Please join me over there if you're on Facebook! 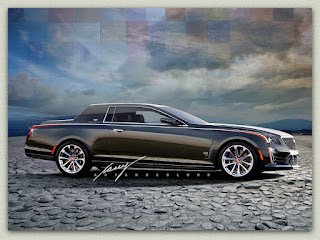 This is a blog that showcases my digitally altered"fake" cars, as well as my love of all things automotive. I collect "toy" cars, car magazines and original dealer literature. I've photographed vintage cars for most of my life. In the past I've owned a '64 Thunderbird, a '68 Sedan de Ville, an '83 Riviera and an '85 Town Car, all great cars in their own ways. 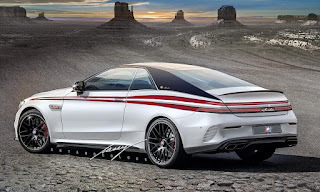 I use Photoshop® to illustrate how I would have styled the cars of yesterday, to modify the cars seen in showrooms today, and to create cars for tomorrow. From the time I was five years old all I really wanted to do was design cars, but I instead earned my bachelor of arts from Vassar College. I've worked as a designer in the field of publishing for more than thirty years. I'm a freelance book designer these days, but I spend more time than I should in Photoshop® "pretending" to live that childhood dream. I'm the same "doodler" as I was a child, but my crayons have become digital. I hope you enjoy the results! 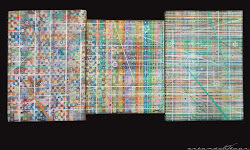 All of the images I post are clickable to enlarge to see in greater detail. Words and images ©casey/artandcolour 2011.